We demystify an ensemble of essentials from every era of computer music. E is for effects, emulators and a lot more. Many reverb plugins offer control over early reflections (ER) simulating the initial burst of sound bouncing off the 'walls' before the more complex full reverb tail kicks in. Early reflections arrive at the ears very shortly after the initial, direct sound (the audio your reverb plugin is affecting) and give the brain a lot of information as to the size, shape and even surface material of the reverb space. An alternative name for 'delay' (see the previous edition of the A to Z of computer music,) although some consider the two to be slightly different, in that 'echo' implies a certain amount of analogue-style degradation/diffusion as the echoes repeat, while the coldly digital 'delay' maintains signal integrity through the repeats. Editing describes everything from moving notes in a MIDI recording or timestretching a sample, to tweaking the parameters on a plugin synth or applying a groove template to a MIDI clip. Pretty much anything done to a pre-existing clip, part or arrangement is considered an edit. In the less literal sense of the word, an 'edit' is an altered version of an established musical element - sliced and rearranged, for example - re-employed for added interest later in the track. In music software, there are many types of editor. The two most common are the MIDI piano roll and audio/sample editor, but a plugin GUI is also an editor of sorts, as is a DAW's arranger and even mixer. Essentially, any window in which you make changes that affect the sound of a track - from its individual components to the master output - is an editor. Reverbs, delays, compressors, EQs, phasers, filters... Anything that accepts an audio input signal, changes it in some way and outputs the result is an effect. In software, these could be plugin effects (in formats like VST, AU, etc), or built directly into software such as a DAW or soft synth. Thousands of individual effects plugins are available at prices ranging from free to hundreds of pounds. MIDI effects, which apply transformative processes to MIDI note and controller data, are rather less well represented and not actually supported by many DAWs. German developers of the Creator and Notator MIDI sequencers and, ultimately, the Logic DAW that was bought by Apple in 2002. Although Apple continued development with Logic Pro and Logic Express, the most significant thing to result from the buy-out (aside from them ditching Windows support) was their intuitive, inclusive and massively popular Garageband DAW, the development of which, it has been suggested by many commentators, was the real motivation behind the move. Without Emagic, the DAW landscape as we know it would look very different indeed. Any software (plugin or standalone) that attempts to 'virtualise' a real-world instrument, effect or component, either algorithmically or via a sampled soundbank. There are numerous software emulations of classic synths and hardware, from the Minimoog (as with Arturia's iMini app, pictured) and TB-303 to the LA-2A and Space Echo; and while purists will seemingly never believe that software can sound like the real thing, the convenience, cost and ability to open multiple instances arguably outweighs any slight sonic discrepancies that may or may not be perceptible. A piece of software for converting audio from one format to another, most pertinently for compressing uncompressed formats like WAV and AIFF to compressed formats like MP3, OGG, etc. 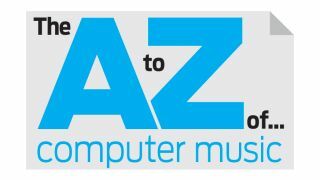 A decoder is then used to play back the encoded file - see last A to Z of computer music for more on this. Conversion of stereo audio to or from mid/side also uses the encoder/decoder terminology. A rotary encoder is a knob on a hardware MIDI controller that converts its position or direction of movement to MIDI CC data. A modulation source in a synthesiser, sampler or effects plugin that controls the amplitude 'shape' of a signal over time. To use the volume of a synth as an example: the Attack stage sets how long the volume takes to rise from zero to the value determined by the strength of the key press; Decay is the time it takes the volume to drop from that peak to the Sustain level, which is the level at which the signal is held until the key is released; and Release is the time the signal takes to drop from the Sustain level to zero once the key is released. The two most common envelope targets are volume and filter cutoff frequency, although today's virtual instruments allow envelopes to be pointed at many parameters. Two common variations on the ADSR are the AD envelope (Attack, Decay) and the ADSHR, which adds a Hold stage of user-defined duration in between the Sustain and Release stages. A processor that 'listens' to an incoming audio signal and converts its amplitude envelope (i.e. loudness over time) into a modulation source. The most well-known envelope-following effect is probably the auto-wah used by guitarists - when the strings are struck harder, the filter cutoff is raised. An envelope follower is also a key component of any compressor, gate or other dynamics processor. Arguably the most important of all mixing and sound-shaping effects plugins, equalisers come in a range of types, all of them designed to allow boosting or attenuating of specific frequencies in an audio signal to creatively change its timbre or make it work with other sounds in a mix. While graphic EQs (the ones with rows of tiny faders) are arguably the public face of EQ, the most versatile and ubiquitous EQ in music production is the parametric (such as the excellent DMGAudio Equilibrium, pictured.) This gives full control over the gain, centre frequency and bandwidth of a number of bands, often including the option to switch the highest and lowest bands to shelving or low-/high-pass modes. Understanding how to use EQ is an absolutely essential skill for any music producer. Most DAWs (Ableton Live being perhaps the most notable exception) feature an eraser among their array of mouse pointer tools, used to delete clips, MIDI notes and other data. Every single thing that occurs on the timeline of a DAW is an event (right down to individual automation curve breakpoints,) but in its original music technology usage, the word referred specifically to MIDI data. Fewer and fewer DAWs include them these days, but once upon a time, the entirely non-graphical MIDI Event editor was an essential tool for making precise adjustments to MIDI Note and CC data. A signal processing concept kicked off by Aphex's classic 1975 Aural Exciter rack, while there is no strict definition of what an exciter or enhancer must do, they generally combine techniques like dynamic EQ, harmonic distortion and synthesis, to apply that oft-quoted 'fairy dust' to a sound or mix - or, more technically, the addition/enhancement of high-order harmonics. Loosely speaking, exciters operate at the top end of the frequency range; enhancers work across the entire spectrum. The opposite of a compressor, an expander is an effect used to increase the dynamic range of a signal, rather than reduce it. While a compressor lowers the volume when the input signal exceeds a defined threshold, thus bringing the loudest and quietest parts closer together, an expander lowers the volume when the signal falls below the threshold, thus moving loudest and quietest parts further apart. Upward expansion also exists, raising the level of signals above the threshold, again, to increase dynamic range. Expansion has plenty of creative and corrective uses, and you probably already employ it more than you realise in the form of gates, which are a type of expander.